In previous analysis it was mentioned STI fell into 2 scenarios -- M1 at 3250.27 and M2 at 3286.08. The break above 3228.38 on 1st Apr 2019 has invalidated the M1 at 3250.27 scenario as it doesn't fit into any Elliott wave correction pattern. 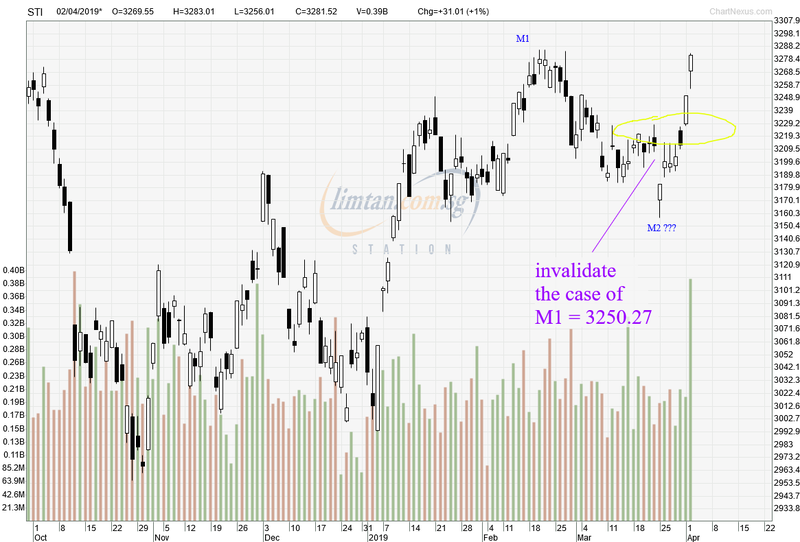 Thus, STI now left with the scenario of M1 at 3286.08. 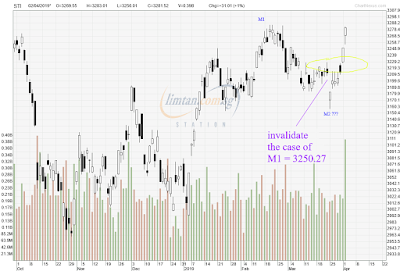 The above chart illustrates the invalidation for the scenario of M1 at 3250.27. 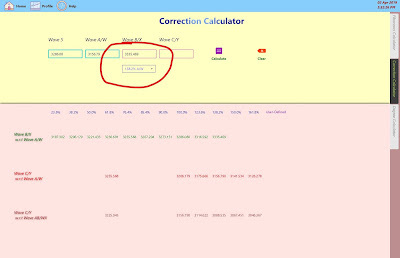 Though now M1 is at 3286.08 but whether M2 has completed at 3156.79 on 25th Mar 2019 is still too early to tell. Despite the intra-day high of 3283.01 today, the present upward movement could be still wave B of the correction pattern with wave A at 3156.79. 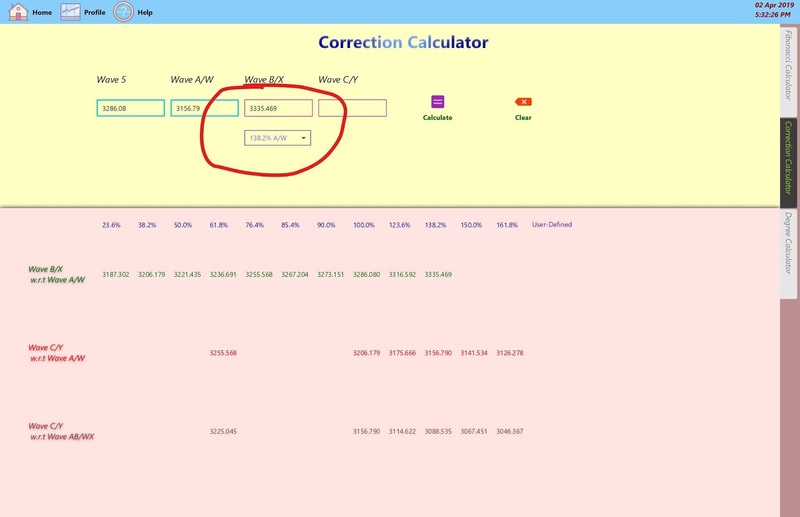 Wave B, depending on the pattern of the correction, could rise to as high as 138.2% Fibonacci ratio of wave A and in this case according the to calculation by the Correction Calculator, the value is 3335.469. Moreover, at 3156.79, it is only a 44.2% Fibonacci retracement from 2993.42 to 3286.08, falling short of the common case of between 50% - 78.6% for a wave 2 correction. 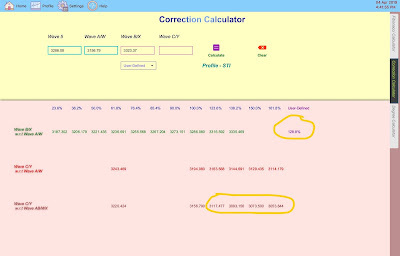 The above are the snapshots showing the breakdown of how the Minor degree should behave if 2993.42 is the end of the last year correction and 3156.79 is the end of Minor 2 correction. 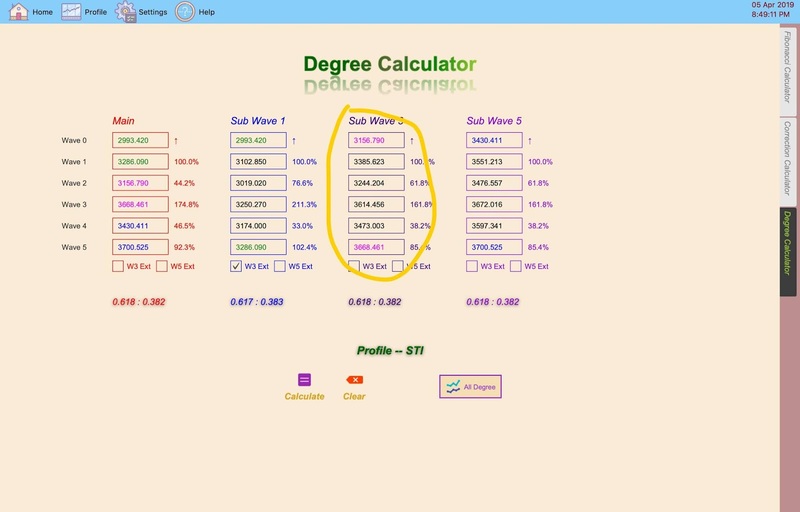 The Minute degree wave 1 is estimated to be around 3299.81 (for a wave 3 extension case) or 3363.773, generated by the Degree Calculator. 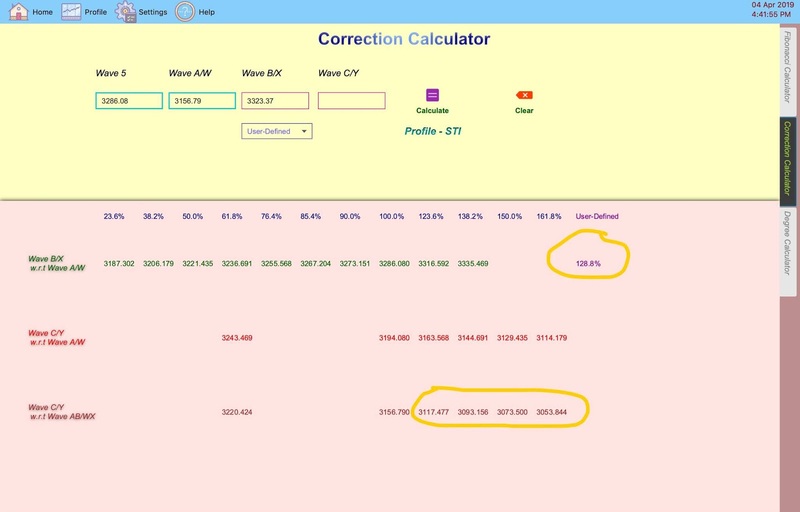 For the wave 3 extension case, the value is within the 138.2% Fibonacci ratio and this has made it a bit difficult to distinguish from wave B. On the other hand, the value for the case of without wave 3 extension is clearly more than 138.2% Fibonacci ratio and this has provided a clearer signal of Minor 2 correction has ended. As for now, it is still not conclusive to indicate Minor wave 2 correction is over so should not be excited by the upward movement these few days. 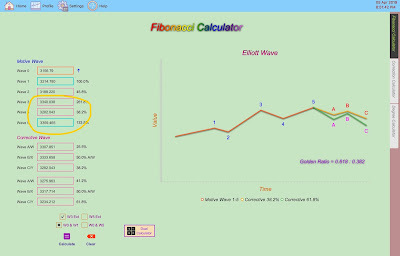 Do also note that the above is just one of the many possible generated data for Minute wave 1. It is still possible Minute wave 1 ends before 3335.469 (or even 3335.469) so just have to observe the moment. STI hit an intra-day high of 3323.37, just 12 points away from the 3335.469 level that could decide whether what it is still in wave B of correction Minor 2 or the upward wave of Minor 3. Should STI turn down from 3323.37 in the next few days, there shall be several key observations to determine which case it is. 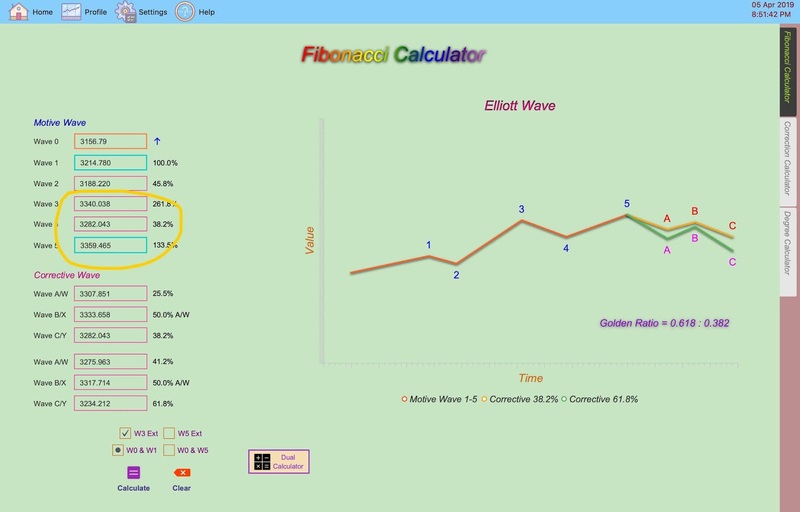 If it is the wave B of Minor 2, due to its current Fibonacci ratio of 128.8% (3323.37), the only correction pattern that fit the description shall be an Expanded Flat. To complete the Expanded Flat, the down leg wave C should do a 5 wave down (inclusive of diagonal pattern) to several of the possible target levels highlighted in the above snapshot from the Correction Calculator -- 123.6% to 161.8% Fibonacci ratio. The above snapshot shows the case that current STI is in Minor wave 3 with Minute wave 1 possible ending at today intra-day high should next few days there is a pull back. The expected Minute wave 2 (should be a typical zigzag pattern) according the the Degree Calculator is around 3225.653 as shown above. Regardless it is still a Minor 2 corrective wave or a Minor 3 impulse wave, whatever going to happen in the next few days in the Minute degree level should be able to provide more clarity of which case STI is in. A 5-wave impulse/diagonal down indicating still in Minor 2 correction. 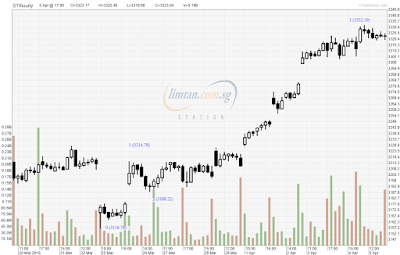 On the other hand, a fast drop and rebound to move higher than 3323.37 shall indicate Minor 3. 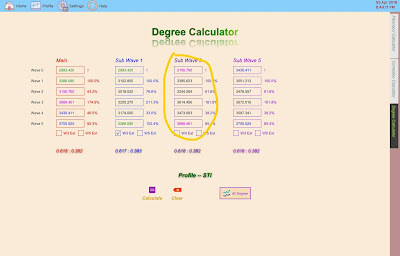 Since it is Minute degree we are talking about, things should happen within the next 3 days. However, should STI continue the ascend in the next 3 days and moving above 3335.469, it can be confirmed it is in Minor 3 (Minute wave 1) already. On an intra-day basis, STI made a higher high at 3332.59 and that could suggest STI is indeed in Minor wave 3 instead of still in Minor wave 2 correction. Above is the snapshot of the original generated Minor wave 3 5-wave impulse movement after adjusting for wave 0 - 2 (already happened). What is of interest now is from wave 2 to wave 3, the 5-wave impulse of the sub-wave 3. 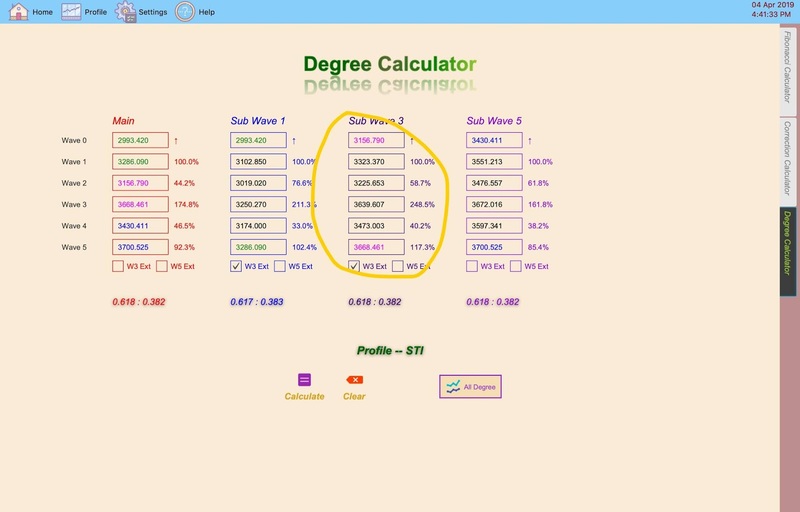 The data generated by the Degree Calculator produces a Minute wave 1 of 3385.623 for the Minor wave 3. 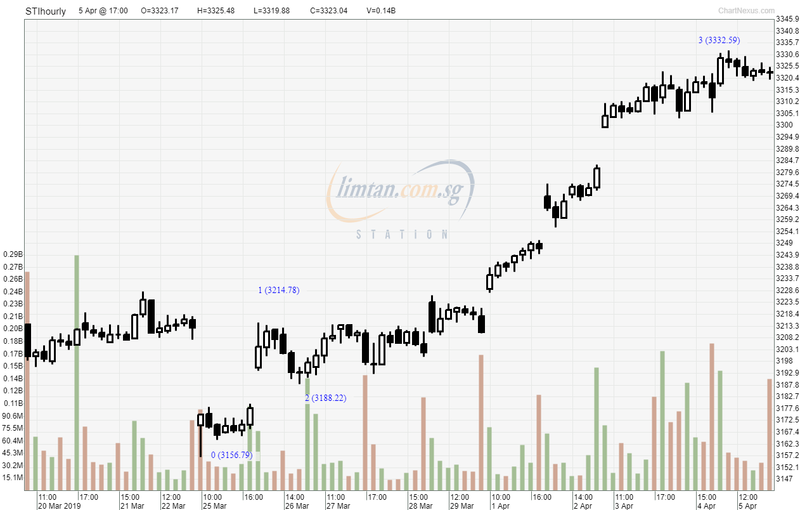 Above is the hourly chart for STI from the low of 3156.79. It appears to form the 3 wave of the 5-wave impulse as indicates in the chart. This could be the Minuette degree of the Minute wave 1 of Minor wave 3. Above is what generated by the Fibonacci Calculator from the wave 0 to 2 of the Minuette degree. The Minuette wave 3 is expected to be at 3340.038 and STI hits an intra-day high of 3332.59 today, 0.22% away from the generated value. That intra-day high value could be end of Minuette wave 3 and what follows next week shall be the pull back of Minuette wave 4. The Minuette wave 5 value generated is at 3359.465 and that is 0.77% from the one being generated by the Degree Calculator (above chart). 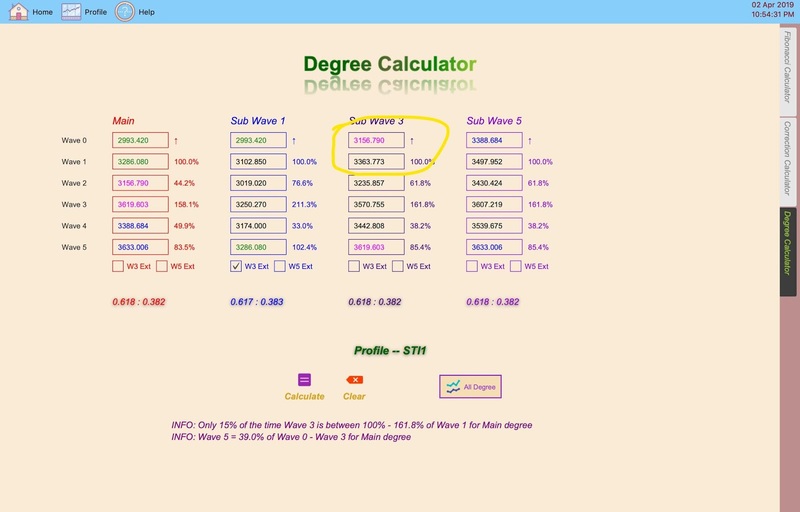 There seems to be a convergence point for Minute wave 1 of Minor wave 3 (3359.465 vs 3385.623) from the top-down analysis (Degree Calculator) and the bottom-up analysis (Fibonacci Calculator). The confirmation should be there if STI do retreat next week in a typical wave 4 style. As it is the Minute and Minuette degree, the pull back for wave 4 and rebound to wave 5 should happen within the next 3 to 5 days.